Post basic passenger travel rights at airports. Don’t protect the airlines. The call to action is simple — DOT should tell us basic passenger travel rights where compensation is involved. Don’t make airline passengers dig through page after page of government regulation. Don’t make passengers guess. Don’t allow airlines to mislead travelers. Do the right thing. This is not a big or difficult request. It doesn’t require any new legislation. The Secretary of Transportation could protect millions of passengers within a handful of months if the Transportation Secretary would choose to put the traveling public benefits in front of those of airlines. Plus, these compensation rights only affect travelers in less than a handful of cases. Why is the Department of Transportation (DOT) keeping these rights under cover? Why isn’t DOT taking advantage of laws already passed to let passengers know their rights? What are three basic passenger travel rights that result in compensation to travelers? Whenever luggage is lost, damaged, or delayed, passengers are by regulation eligible for up to $3,500 per passenger in compensation for domestic flights and about $1,600 for international flights. When a passenger is bumped off a flight, they are eligible for up to $1,350 in cash. When international flights are delayed passengers are eligible for compensation depending on the airline they are flying and their destination. 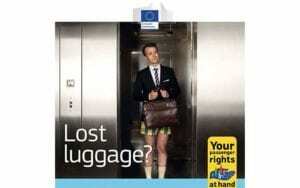 In Europe, the government has asked airports to put up posters in baggage carousel areas explaining to passengers that if luggage is lost, delayed or damaged, that they have rights. Some posters inform passengers of compensation when flights are delayed. Others explain the denied boarding compensation rules that come into play when travelers are “bumped” from overbooked flights. The European-spearheaded passenger notification effort has been a rousing success. Passenger rights posters are found in virtually every airport in Europe and are displayed where they do the most good — in baggage carousel areas and at boarding gates. In the USA, these kinds of public notifications informing passengers of basic passenger travel rights are lacking. Why? The DOT has not required airports to post these kinds of notices for passengers, as the law passed by Congress allows. Airports care more about airlines than they do about their passengers — the very public that funds their operation through passenger facility charges and that makes airport construction possible through municipal bonds. Airlines are loathe to tell passengers their rights. They would rather bargain with ignorant travelers than face an informed customer. The DOT has the power under legislation to require airports to display public service announcements about basic passenger travel rights that the Secretary of Transportation deems in the public interest. This has been a part of every air travel appropriations bill for the past decade. A recent DOT report about fines imposed during this past year shows that virtually every airline checked for compliance with passenger notifications and accurate rule disclosure was found to be lacking. It is time for a change. As simple a notice as this two-sentence sample would do it on ticket itineraries and on computer-generated boarding passes. Travelers United has already prepared a presentation showing that posters can be put up at airports or shown on video displays. This can be done at virtually no cost to the government. Production of these customer service posters can be subsidized by advertisers and can be displayed as many other public service announcements are displayed throughout airports across the country. Not informing passengers of their rights is simply unfair. The solution is easy, and championed by consumers and consumer advocates on both sides of the Atlantic. Only airlines stand to gain from uninformed passengers. It’s time to inform travelers and DOT should lead the charge.